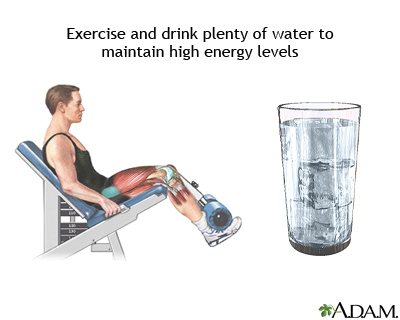 Hot weather combined with a lack of enough fluid in the body to carry on normal body functions can lead to dehydration. It is important to drink plenty of water during physical activity to maintain optimal energy levels and to prevent dehydration. Updated by: Caroline M. Apovian, M.D., FACN, Associate Professor of Medicine, Boston University School of Medicine and Director, Nutrition & Weight Management Center, Boston Medical Center, Boston, MA. Review provided by VeriMed Healthcare Network.